Author: Siegmund Brauner. Series edited by: Wilhelm J.G. Möhlig, Bernd Heine. Shona (ChiShónà) is the most important national language of Zimbabwe, spoken and understood also in neighbouring countries. This sketch represents a concise description of the grammatical structure of the standard form of the language including historical notes and some sociolinguistic data. The description follows mainly Doke’s linguistic terminology of the Bantu languages. It contains chapters on phonology, tonology, morphophonological rules, nominal and verbal morphology and function of other parts of speech (adverbs, prepositions, conjunctions, interjections, ideophones). 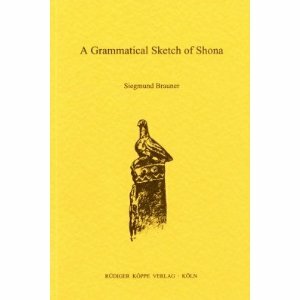 Two charts on the consonant system of Shona, the various pronominal constructions and a survey of important linguistic literature on the language are added. Although the book is a potted grammar, it is multum in parvo. It may prove useful to comparativists, not only of African languages but also to those who need to gather a wide selection of grammars from among the world’s languages for illustrative purposes of comparison.